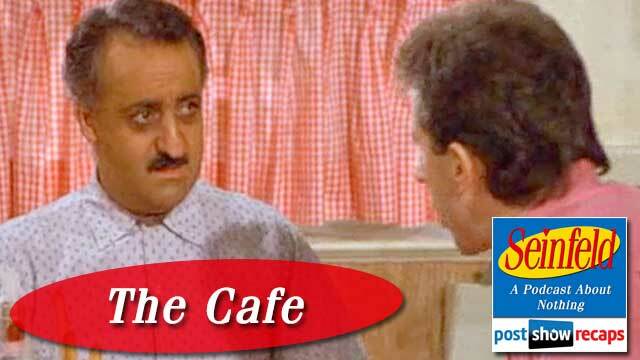 Rob Cesternino and Akiva Wienerkur were not very, very bad men this week in their recapping of “The Café”, which first aired on November 6, 1991 during the third season of Seinfeld’s original run. Both agreed that they are fully in the mix of greater episodes after the rough start of seasons one and two. Since there was no current news in the Seinfeld universe, they got right to it. Jerry’s opening standup was a bit about the certain store in a neighborhood that could not have success, referring to it as the Bermuda Triangle of retail. Akiva had a restaurant near him in college that would open and close every few weeks, that just didn’t find success. He also shared that the writer of this episode had based the Dream Café on a real life restaurant. The episode opens with Jerry and George standing on the sidewalk talking. Jerry is distracted, looking at and commenting about a new restaurant in his neighborhood, while George is fretting about his new girlfriend thinking he’s both nice and smart, to which he knows he’s neither. George gets frustrated with Jerry for not listening to his plight, especially since he doesn’t know what to do about having to take an IQ test where Monica will learn the truth that he’s not smart. When Jerry asks George what he got on the SATs, George says he tells people 1409, but will go to the grave with his real score. Rob noticed that the score itself is proof that it’s a lie, since it’s not a multiple of ten. Akiva shared that Zack Morris from Saved By The Bell also had an SAT score that ended in an odd number. Then, they speculated what score George could have actually earned, and they settled on around 820. In the next scene at Jerry’s apartment, he is looking out the window with binoculars at the Dream Café, worrying that it compares to a spider clinging for life to the side of the toilet bowl. Rob and Akiva noticed that the hat on the Nerf hoof is once again the Yankees, having switched from Mets to Yankees several times over. They wondered if there was a battle between Larry David and Jerry over this. Elaine meanwhile, is reading at the table, randomly saying the Latin phrase casus belli. When George comes in talking about having to take the IQ test, Elaine mentions she got a 145, which prompts George to think she should take the test for him. Since Monica lives on the first floor, he can just hand the test out the window to Elaine, a legendary feat that he once pulled off in college. Jerry adds that she could go down the road to the Dream Café, since it’s so slow enough to hear a pin drop. They all agree to do this, since they love a caper. We are introduced to Babu Bhatt for the first time in the next scene. Rob and Akiva pointed out that Babu is the first real recurring character to be in a scene besides Jerry’s parents. When Jerry enters the restaurant, Babu is very happy to serve him, telling him about the eclectic menu items, from moussaka to franks and beans. While at the restaurant, Jerry has several inner monologues about how good a person he is for supporting this neighborhood restaurant. Cutting quickly to the next scene, George is at Monica’s preparing to take the test, feigning arrogance about how well he is going to do. Rob and Akiva enjoyed the pace of the editing, how they would cut from the restaurant and back to Monica’s apartment. Elaine shows up outside the window and takes the test down to the Dream Café. Once there, Babu convinces Elaine to order the rigatoni, even though she wanted something simple while she takes the test. When Kramer comes in, he constantly disrupts and annoys Elaine. He is talking about the jacket, aforementioned in “The Parking Garage”, and how he doesn’t want this friend of his mother’s to take it back. He argues with Jerry about whether the term is statue, or statute of limitations, further aggravating Elaine. After Elaine moves tables to get away from Kramer, he continues to cause a disruption, nearly knocking the whole table over when Babu hands him a hot towel. As Babu is enthusiastically catering to Elaine, he knocks over Elaine’s coffee and rigatoni all over the IQ test. After Elaine leaves, Jerry decides to give Babu advice on the restaurant. He tells him he should scrap the idea of a wide range menu, and focus on the cuisine of his native Pakistan. Akiva and Rob debated whether Jerry’s advice was good, both concluding that Babu shouldn’t have been mad at Jerry for it failing, since no one was in there before the change anyway. When Elaine brings back the test to George, she explains that Babu spilled food all over it. When George has to explain this to Monica, he tells her that he had a sandwich in his pocket, and hopped out the window to get some coffee. In the next scene, Jerry is back at his window, watching the reopened Dream Café. Elaine and Kramer are also there, as Kramer is asking them to tell the angry man looking for his jacket that they haven’t seen Kramer. Jerry notices George walking up to the building, so he yells down, asking how he did on the test. George shouts up, “85”. This upsets Elaine, who can’t believe it was that bad. When George comes in, he greets Elaine with “Hello Professor”, a line that Rob really enjoyed. Akiva noted that this was a breakout episode for the quintessential, rapid fire good lines. Elaine wants a chance to retake the test, but George worries she could do even worse than an 85. Jerry offers his apartment as a quiet place for her to take it, so George agrees. In the next scene, Jerry walks into the revamped Dream Café, feeling quite regal about giving Babu such great advice. Babu however has completely changed his tune, and is no longer welcoming and nice. There is a brief standup bit where Jerry talks about standardized tests, and how the way someone fills in the bubbles should factor into their scores. Back to the episode, Elaine is at Jerry’s apartment taking the test, when Kramer bursts in, with the man after his jacket right behind, banging on the door. She has to get the test back to George, but with the man outside the door, she won’t make it back in time. At Monica’s apartment, George is pacing, and Monica informs him time is up, so he has to make up some new lie. Akiva noted that even though George is a master liar, there was no getting out of this one. At the Dream Café, Jerry calls Babu over to comment on the shrimp, which causes Babu to lose it, blaming Jerry for ruining his restaurant, calling him a very bad man, one of the classic lines from the series. When Elaine finally gets back to Monica’s apartment with the test, Monica opens the window and sarcastically tells Elaine she hopes she does better this time. In the next scene, they are all outside, Kramer without his jacket, arguing over where to eat. The episode closes with Jerry saying that it would be great if there was a restaurant where you could get all types of food, much like the original Dream Café. In the closing standup, Jerry has a bit about how superheroes wear masks so no one can come back to them later for the damage they cause when the come to save the day. Rob and Akiva discussed how in real life, the damage the superheroes cause would be billions of dollars. In 2014, there would be a few things different about “The Café”. George could have Elaine on Skype, with her feeding him the answers, or he could have merely Googled the answers on his phone. In addition, Jerry could have posted a bunch of positive Yelp reviews for the Dream Café. Akiva pointed out that Jerry would probably have quite a few followers on Twitter that he could recommend Babu’s restaurant to. Next the guys tackle the mail bag. Emailer Hunter asks if they had their own Dream Café, where they are essentially the only customers any time they are there. Rob had a sushi restaurant near him where that was the case, but it didn’t stay open very long. He also asked how they felt about the storylines tying together, if it was implausible. Both Akiva and Rob felt it worked just fine. Johnny De Silveira wondered what kind of ethnic food they like the most, his being Mexican and Portuguese. Akiva agreed with Mexican. Rob though he might not like Pakistani food, since it’s spicy, but had never had it before. Johnny also wondered what they got on their SATs. Akiva got a 1280, while Rob got a 1420, but only because he crammed, and not because he was a dedicated student. Akiva wanted Johnny to disclose his scores, but realized he’s from Canada, so the testing could be different. Rob said for Johnny to share that in his next email. Emailer Chester asked what they thought George’s actual score was. Both agreed that it was probably under 1000. He also pointed out that none of the four characters ever seem to have anything to do during the week. Next, he asked why they keep referring to Monks as a coffee shop, when it’s more of a diner. Rob agreed that it’s a diner, not a coffee shop. One last email came in from Matt, who wondered about Jerry’s inner monologue, and how he actually felt guilt, when the series really defines all the characters as reprehensible. Akiva pointed out a few instances he can remember where Jerry has a moral inner monologue, and Rob agreed that this would be something to track as they get further along in the series. Rob tried to guess where Akiva ranked “The Café”. He correctly narrowed down that it was better than “The Chinese Restaurant” at 79, but not better than “The Pony Remark” at 47, falling in at 75. Rob felt that it was better than “The Pony Remark”. Next week, they will recap “The Tape”, where someone leaves a seductive message on Jerry’s tape recorder. Don’t forget to subscribe to the podcast by going to postshowrecaps.com/seinfeldITunes, where you can’t rate and review the podcast. Let them know what you thought of the episode by leaving your comments on the page, and get your questions to the guys by emailing [email protected] You can also follow Rob and Akiva on twitter @robcesternino and @keev26. Join us next week when Rob and Akiva discuss Seinfeld season 3 episode 8 of the show, “The Tape”.